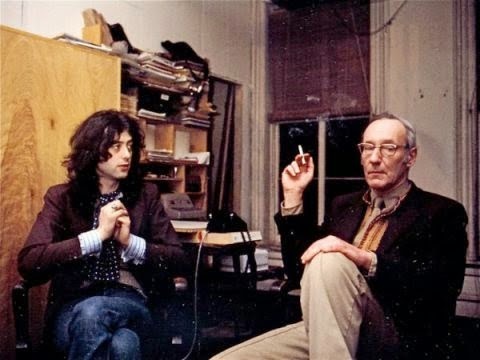 Here is the first sentence of the William Burroughs article, from the June 1975 issue of "Crawdaddy," on a rock band you might have heard of: "When I was first asked to write an article on the Led Zeppelin group, to be based on attending a concert and talking with Jimmy Page, I was not sure I could do it, not being sufficiently knowledgeable about music to attempt anything in the way of musical criticism or even evaluation." You'd have to do a pretty good job of avoiding rock music to be really unfamiliar with Led Zeppelin, but if William Burroughs was as ignorant as he claimed, he sure did a good job with his article. Oz Fritz (who furnished the link with his roundup on some of his current music projects, plus Steve Fly's project, ) says the article is "some of the most articulate writing on magick and music your correspondent has seen ... You can consider the entire interview required reading - when time permits - for anyone who claims to be a sound engineering student of mine." I did the homework assignment right away, Oz! The caption for this photo, on the Jack & the Bear MTV artist page, is "Grammy Award winning producer Oz Fritz (Tom Waits, Primus) working the knobs on a very special project for Jack & the Bear." This WSB article on Page/Zep appeared in some collection of 1970s articles - a book - with a title I don't recall. It may have been a Crawdaddy collection, but I don't think so. Anyway, I was surprised that WSB had any connection to Zep/Page, and I agree with Oz Fritz: it's a GREAT article. Ever since I've tried to get a line on Page and his uses of Crowley. There's some meaty riffs in Erik Davis's short but delightful book on the 4th Zep record (old man with bundle of sticks on his back, the one with Stairway To Heaven on it). Erik Davis always impresses me, with anything he writes about. Recently, Brad Tolinski published a book based on interviews with Page: _Light and Shade: Conversations With Jimmy Page_. Tolinski strikes me as someone who knows almost nothing about Crowley, and the book suffers from this. I don't think you can get Page to open up about Crowley unless you can ask him very good, informed Qs. See pp.170-171 on Page talking about Crowley as a liberating figure within the context of British art schooling and mythology, etc. See pp.180-186 on Page's Equinox occult bookstore. How awesome it would have been if RAW had been able to interview Page, but I really don't think Bob liked that music. If anyone would like to cite some favorite sources on Page and Crowley, please do so.